Summer Forecast: Who will be the NBA's MVP in 2018-19? James Harden ran away with the MVP award last season. Can he win it back-to-back? The Beard will surely have stiff competition with many of the usual suspects. Will LeBron James lead the Los Angeles Lakers to the playoffs and earn his fifth MVP award? Or could this be the season Anthony Davis or Giannis Antetokounmpo capture the crown? 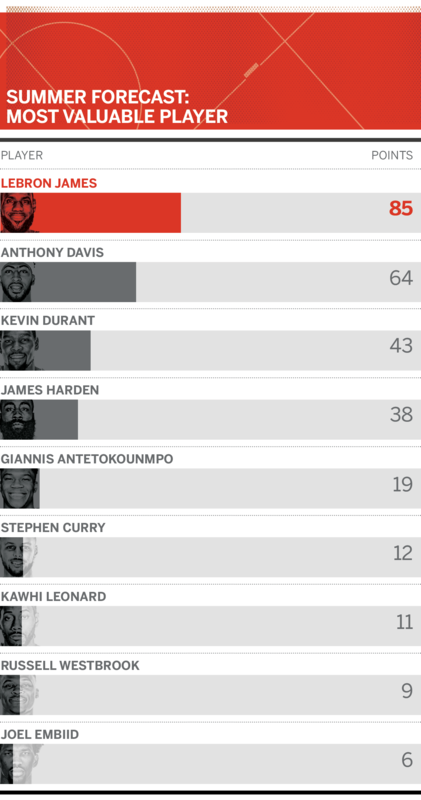 We asked the ESPN Forecast panel to rank its top three choices for the 2018-19 NBA MVP, with a first-place vote receiving five points, a second-place vote receiving three and a third-place vote receiving one. Despite being widely considered the best basketball player in the world, LeBron hasn’t won an MVP award since the 2012-13 season. But what if James and the Lakers surprise everyone and make a run to a top-four seed in the Western Conference? James would have a compelling narrative in leading the NBA’s glamour franchise back to the playoffs after a six-year drought. Davis played masterfully down the stretch last season, averaging 29.8 points (52.0 FG%, 84.5% FT), 11.8 rebounds, 3.5 blocks, 2.1 assists and 2.0 steals in 24 games after the All-Star Game without running mate DeMarcus Cousins. Durant has won back-to-back NBA Finals MVP awards for the two-time defending champion Golden State Warriors, cementing his status as an all-time great. While James is the consensus best player in the game today, Durant is often considered his biggest challenger. Harden won his first NBA MVP award last season, capping his third top-two finish in the MVP vote in the past four seasons. He led the Rockets to the best record in the NBA and, perhaps, was one Chris Paul hamstring injury away from the NBA Finals. Despite that, the Warriors will enter this season as massive favorites to win the championship again. Antetokounmpo is coming off a magical season in which he averaged 26.9 points (52.9 FG%, 76.0% FT), 10.0 rebounds, 4.8 assists, 1.5 steals and 1.4 blocked shots, leading the Bucks to the playoffs and finishing sixth in the MVP voting. Curry has to deal with splitting the vote with his teammate, Durant, and the perception that he may not be the best player on his team. On the other hand, Curry still has the game he had when he won two MVP awards and perhaps a bit of added motivation after being passed over for the Finals MVP award for the third time. Leonard finished in the top-three in the MVP vote in both of the 2015-16 and 2016-17 seasons, before his well-publicized quad injury forced him to miss all but nine games last season. Meanwhile, the Raptors quietly turned in the second-best regular-season record in the NBA last season with 59 wins. Also receiving votes: Russell Westbrook (9 points), Joel Embiid (6), Kyrie Irving (5), Chris Paul (3), Ben Simmons (1). Previous article Can a Robot Know When It’s Wrong?